If you've ever visited a health store you'll have seen a huge range of herbal medicines on sale; in chain chemists and supermarkets the range of herbal medicines is increasing all the time. People these days, more than ever, are seeking to escape the synthetic world and live a more natural life-style. Not that herbal medicine is new; it's been in use for about 5,000 years or more. The first written record dates from 2800 BC when Sheng Nung, a Chinese emperor, wrote what was an authoritative essay about the use of herbs in medicine. One of the treatments he recommended was ephedra (Ma Huang) for respiratory disease; today ephedrine, which is extracted from ephedra, is used as a decongestant and, in its synthetic form, is found in many cold-relief preparations that can be bought over the counter everywhere from chemists to corner shops. The World Health Organisation, in a study of pharmaceutical medicines derived from plants, notes that three-quarters of them have the same medicinal uses as defined by the old traditions proving without doubt that granny does know best! Today the WHO estimates that 80% of the world's population relies on traditional herbal medicine. In rural communities, medicinal herbs are sold in markets alongside fruit and vegetables, and remedies are passed from generation to generation within families, as well as through practitioners of the skill. China and India are both great proponents of herbal medicine but while China is leading the way in combining traditional with modern treatments, in India the two are still largely kept separate. Naturally enough, herbalism means the use of herbs to treat illnesses or conditions. A herb is a plant that has medicinal and/or culinary properties. 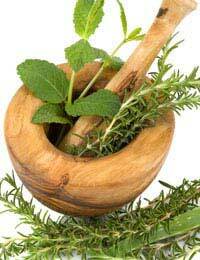 Herbs produce a variety of chemicals that work within the body, stimulating some senses and dulling others. While herbs can be used to treat conditions, a healthy diet can help prevent illness in the first place, and Asian cooking is a particularly good place to start if you want to improve your diet. If you've read any of the specialist Ingredients pages, you'll see that many of the vegetables or herbs that are used every day in Asian cookery have particular properties: you might even wonder how it can be possible that anyone following an Asian diet could ever get sick! So here's a brief guide to ingredients, used a lot in Asian cooking, that are particularly good for your health,. ChilliProduces endorphins, natural painkillers. Rich in vitamins A and C, recommended for lowering cholesterol and boosting the immune system. CoconutCoconut oil is rich in lauric acid, which is known to have anti-bacterial, anti-fungal and anti-viral properties. Curry leavesContain a chemical compound that is being investigated as a possible treatment for diabetes. Also used in traditional medicine to treat skin and digestive conditions. GarlicScientifically proven to have excellent antibiotic qualities. Research also suggests that it can help stop colds developing. GingerVery effective as a remedy for motion sickness and upset stomachs. It also has anti-fungal properties that will ease the irritation of athlete's foot. Remember to consult a doctor or herbalist if you're thinking of trying herbal remedies, especially if you plan to prepare them yourself. Most big towns and cities will have a Chinese herbal practitioner.